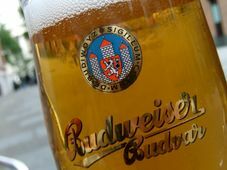 There's a new Czech lager on the American market with a centuries old tradition and a highly contentious name: Budweiser Bier. That's beer spelt the German way, b-i-e-r. But it should come as no surprise that Anheuser-Busch of St. Louis -- the world's largest brewer and the maker of Budweiser beer, b-e-e-r, is having none of it. And so, just as the lager known here as Budweiser Budvar must be sold as Czechvar in the States, this relative newcomer to the Budweiser trademark battle will be labelled B.B. Burgerbrau, although marketed as "beer from the Czech city of Budweis." 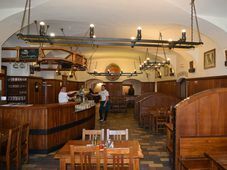 Budejovicky Mestansky Pivovar, or BMP, was founded in 1792, claims to be the oldest brewery in Ceske Budejovice, the southern Bohemian city known also as Budweis in German. The lager it is now reintroducing to the States was first brewed in 1802 and called "Budweiser Burgerbrau," or Budweis city brew. This label will read 'B.B. Burgerbrau' on bottles sold in the US The Americans registered their "Budweiser" trademark in 1876; the Czech's "Budweiser Budvar" was first brewed in 1895. But the Director of Sales for the BMP Brewery, Miroslav Zeman, says that although his brewery had a 75-year jump on its rivals, it lost a lot of valuable time in the Budweiser trademark battle thanks to communism. "Both [of them] are claiming that they are the 'original' Budweiser. Our position is difficult because, in a way, the most serious damage to this brewery was during communism, and a lot of [trademark] registrations were made by both rivals during that time. So we are kind of latecomers in many, many markets. So we need to protect our rights and, slowly, in some markets we've been successful -such as in Greece and Austria- and in others, less successful." After the Communists nationalised the brewery in 1948, it was pressured into giving up trademark rights and into adopting less German-sounding names for its products, like Samson and Crystal. Mr Zeman says it was also told to reduce the alcohol content for these new "workers' brews." Budweiser Budvar (or Czechvar in the US) Following the Velvet Revolution in 1989, the new Czech democratic government reinstated BMP's domestic right to use the "Budweiser Bier" and "B.B. Burgerbrau" trademarks, and the two-hundred year old lager appeared on the shelves in the late 1990s. It is brewed today in the same place with the same recipe, ingredients and brewing methods from the 1800s. The US advertising campaign will play the history card, says Rob Neuner, president of Classic Beverages, which is the exclusive importer of BB Burgerbrau in the States. "Anheuser-Busch has their Budweiser, which was started in 1876 and Budweiser Burgerbrau was actually first branded in 1802, whereas Budvar was actually branded 20 years after Anheuser-Busch. So we have the historical perspective, which we like to play up here." 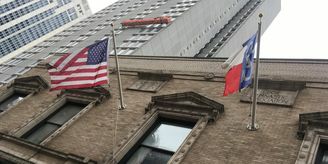 Classic Beverages started introducing the beer to big cities like Chicago and New York in April. They plan a national roll out of the brand in about six months time - but hope to launch in St Louis, home to rival Anheuser-Busch, by the end of September. 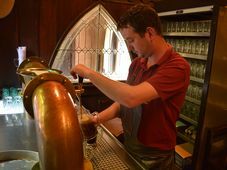 "We're not calling the beer 'Budweiser' for this country [USA], we're calling it 'BB Burgerbrau,' but what we are able to say is that it is from the Czech city of Budweis. 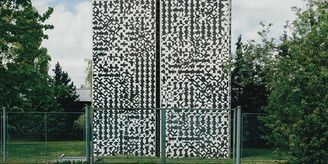 And we're not using so much the term Ceske Budejovice -- for two reasons; one, that most people refer to the city as Budweis and secondly, most Americans can't pronounce Ceske Budejovice."